Yearbook type: Genetic Engineering Appraisal Committee asked. It was given on Page 303 of IYB-2015. Ganga Basin Authority asked – but it’s given in IYB-2014. low-profile org. such as Biocarbon fund, Forest carbon facility, birdlife international. RIO+20 asked. (it was held 20 years after the first earth summit @Rio). Lunacy of low-profile org. MCQ continues- this time TEEB, GHG-protocol, Desertification convention etc. — Good number of questions from topics that were hot 2 Mains ago e.g. Ganga authority, Net Metering, Kasturi-Gadgil etc. MCQs on Environmental R&D e.g. Biotoillets, IndARC, fuel cells. None. Good no. of MCQs on climate-forest types, park-vegetation, dominant tree species. Only one- on red sanders. For environment, As such the 2016’s paper is more- like 2015’s paper i.e. Majority of MCQs in easy to medium category. Unlike 2014’s paper where environment was a very tough cookie to crack. Since UPSC has combined the preliminary exams of both civil services and forest service, therefore, 1) significant portion of the paper will be occupied by this topic 2) some of the questions will be rather tough/technical for ordinary aspirant. But all in all, not too much outside the conventions sources i.e. NCERT, NIOS, ShankarIAS and Mrunal’s lecture videos on the international summits. Preparation should be centered around this circle. With this article, general studies Answerkey is over. So how does the overall paper look like? From 2015: 2 from April, 1 from May, 2 from Jun-July, 2 from September, 3 from October, 1 from November. From 2016: 1 from feb, 1 from April, 2 from Jun-July. Remaining MCQs were such that sporadically came everyone in while in newspaper, so difficult to fix month and date. But all in all, majority of the current affairs question were from last year (2015). And no more than 3 MCQs from any individual month. Is the number of questions asked from Theory. If matter happened two mains ago, then also I count it as theory rather than current e.g. project Loon, Air Quality index, BRICS Banks, Bitcoins, BEPS, Mangalyan etc. Good no. of these ‘contemporary/theory’ question were from the year 2014. 49: easy– verbatim given in NCERT, Mrunal and other routine sources, and were easy to remember and recall in exam hall. 33: tough questions i.e. A) either not available in routine books, newspaper reading; had to dig internet to get answers OR B) very trivial-minute information sought from NCERT/Lucent etc. standard sources. Yes as such more than 33 MCQs will look tough in the examhall, because UPSC did not ask much from the convention geography, polity, so less attention was paid even to IR, PIN etc. 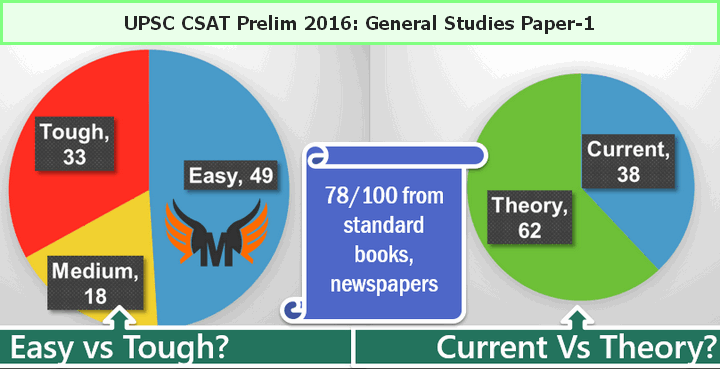 78 out of 100 MCQs – solvable through routine sources (NCERT, IYB, Survey, Mrunal, theHindu, Indianexpress). Remaining 28 were such that, I had to dig google books and random websites on internet. It doesn’t mean 78 questions were easily solvable. Refer to previous row on toughness. But this is to show that UPSC paper doesn’t fall from sky. No secret / expensive coaching material is necessary for success in prelims. Majority of the questions come from standard reference sources. 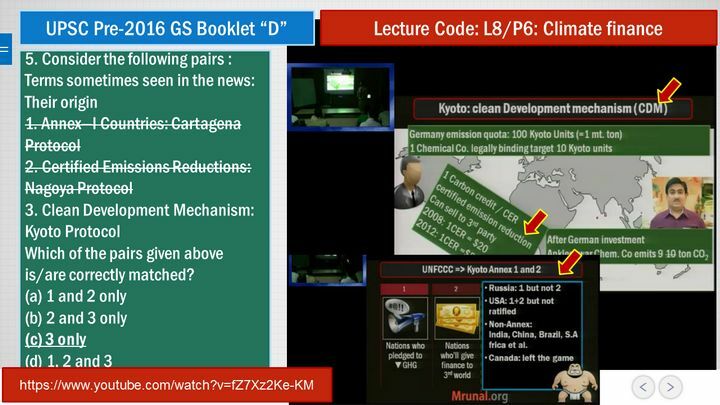 Mrunal Lecture L8/P6: Climate finance: All three terms are associated with Kyoto Protocol. Therefore, answer “C” 3 only. 27. With reference to an initiative called ‘The Economics of Ecosystems and Biodiversity (TEEB)’, which of the following statements is/are correct? 1. It is an initiative hosted by UNEP, IMF and World Economic Forum. 2. It is a global initiative that focuses on drawing attention to the economic benefits of biodiversity. 3. It presents an approach that can help decision-makers recognize, demonstrate and capture the value of ecosystems and biodiversity. 29. Which of the following statements is/are correct? By extending the logic, forest conservation and SDG-jholachhap-giri ought to reduce poverty e.g. using MNREGA labour for re-forestation /plantation etc. ShankarIAS Environment book Page 254 mentions – REDD+ incorporates livelihood improvement. So, #3 is correct. Answer “D”. Counter argument : Although REDD+ has galvanized significant support internationally, among both developed and developing countries, its implications for poverty alleviation at the local level remain unclear. (says this google book hence 3rd statement is wrong. So answer could be “A”- 1 and 2 only. Final answer: UPSC’s official answerkey. 30. What is ‘Greenhouse Gas Protocol’? 2. It originated in the World Summit on Sustainable Development held in Johannesburg in 2002. 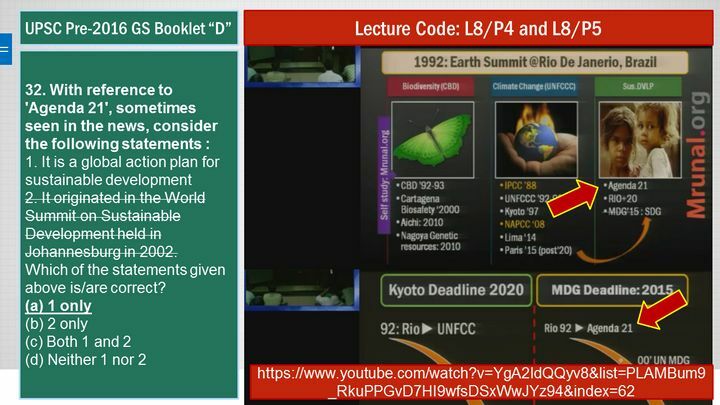 Mrunal’s Lecture L8/P4 and P5: Agenda-21 associated with SDG and originated from Rio earth summit in 1992. Another source, Mrunal’s article on Rio+20: Agenda 21 is a non-binding, voluntarily implemented action plan of the United Nations with regards to sustainable development. It is a product of the Earth Summit held in Rio de Janeiro, Brazil, in 1992. Therefore, only first statement right. (1) The International Solar Alliance was launched at the United Nations Climate Change Conference in 2015. (2) The Alliance includes all the member countries of the United Nations. 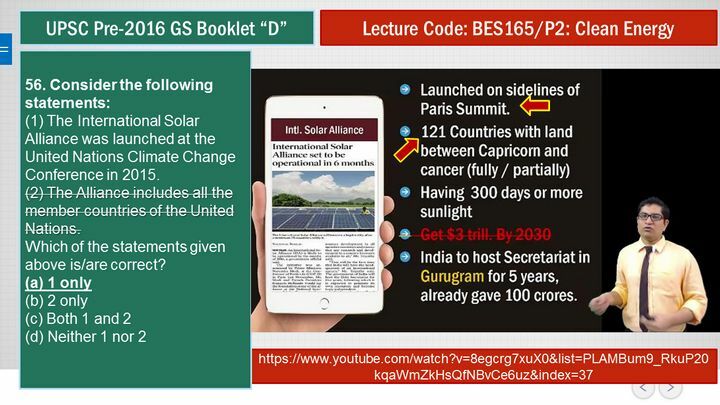 Mrunal’s lecture BES165/P2: Clean Energy. While ISA was launched on Sidelines of Paris Summit, therefore first statement right but it includes only the 121 countries between Capricorn and Cancer receiving sunlight for 300 days or more. Hence 2nd statement wrong. 72. With reference to the Agreement at the UNFCCC Meeting in Paris in 2015, which of the following statements is/are correct? 1. The Agreement was signed by all the member countries of the UN and it will go into effect in 2017. 2. The Agreement aims to limit the greenhouse gas emissions so that the rise in average global temperature by the end of this century does not exceed 2 °C or even 1.5 °C above pre-industrial levels. 3. Developed countries acknowledged their historical responsibility in global warming and committed to donate $ 1000 billion a year from 2020 to help developing countries to cope with climate change. 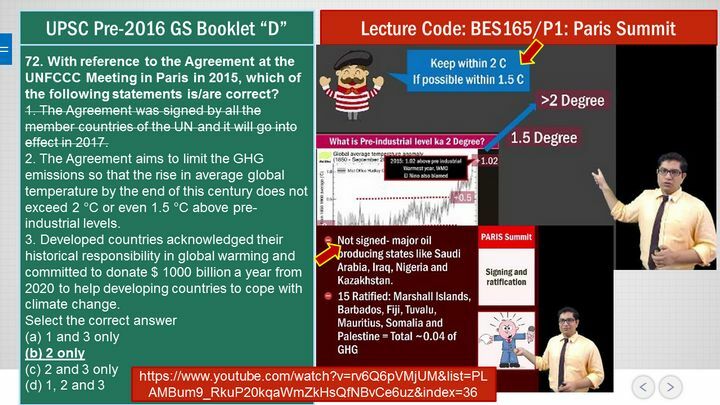 Mrunal’s Lecture BES165/P1 Paris Summit: Paris Summit- not all nations have signed the agreement and there is no deadline to ratify it. hence, statement 1 is wrong. This eliminates A and D. And developed countries committed to give $100 billion by 2020. and for future, there is no mention of giving $1,000 billion dollars. Therefore third statement wrong. We are left with Answer (B) only. 1. The Sustainable Development Goals were first proposed in 1972 by a global think tank called the ‘Club of Rome’. 2. The Sustainable Development Goals have to be achieved by 2030. Club of Rome talked about “limits to growth”. But I’m unable to find concrete source that specifically says they were the first to propose. 2nd Statement is right: Mrunal’s Lecture BES166/P4. 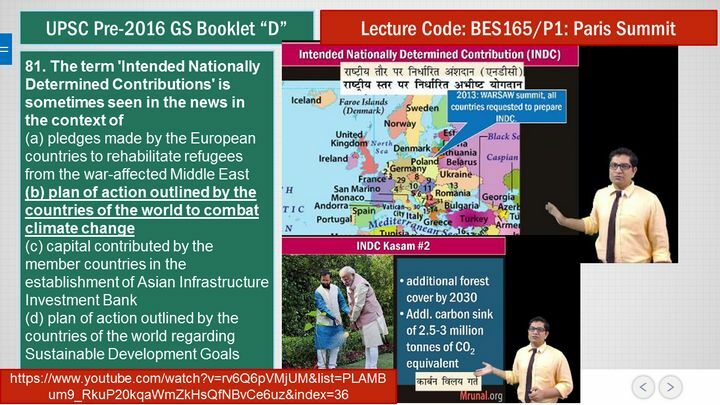 Mrunal’s Lecture BES165/P1 INDC are associated with UNFCCC-Climate change. 88. What is/are the importance/importance of the ‘United Nations Convention to Combat Desertification’? 1. It aims to promote effective action through innovative national programs and supportive inter-national partnerships. 3. It is committed to bottom-up approach, encouraging the participation of local people in combating the desertification. Therefore, answer C. Tough question. 8. Which of the following best describes/ describe the aim of ‘Green India Mission’ of the Government of India? 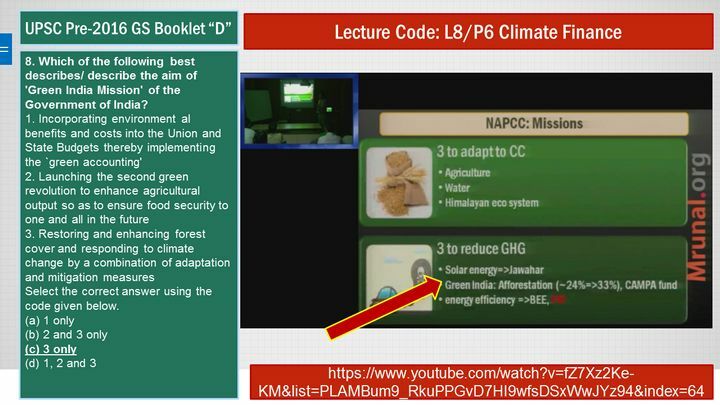 Mrunal Lecture L8/P6: Green India = afforestation. Hence only 3 is right. Another source: India Yearbook 2016 page 338: Environment ministry has launched National Mission for a Green India through a consultative process involving relevant stakeholders, aimed at both increasing the forest and tree cover by 5 million ha, as well as increasing the quality of the existing forest cover in another 5 million ha. Hence I keep saying, lot of MCQs from topics that are ‘two mains old’. 53. On which of the following can you find the Bureau of Energy Efficiency Star Label? 61. In the cities of our country, which among the following atmospheric gases are normally considered in calculating the value of Air Quality Index? Mrunal summary note on Air Quality index: Among them, NO2, SO2 and CO are given. Hence by elimination, option “B” is correct. Ye bhi 2 mains old topic. 98. Which of the following are the key features of ‘National Ganga River Basin Authority (NGRBA)’? 1. River basin is the unit of planning and management. 2. It spearheads the river conservation efforts at the national level. 3. One of the Chief Ministers of the States through which the Ganga flows becomes the Chairman of NGRBA on rotation basis. In 2014, UPSC asked similar question, where one of the statement was- “PM is chairman of NGRBA”. Ref: Mrunal’s answerkey. That statement was right as per India Yearbook 2014. Therefore, here statement 3 is wrong, CM can’t by the chairman of NGRBA. By elimination, we reach answer (A). Alternative Reference: ShankarIAS Environment book Ch.5, page 56 – third paragraph. Matlab- “2 PRELIMS old Topic”! They’re associated with Western Ghat conservation plan. Mrunal’s article Four years ago. Ye toh hadd hi ho gyi. 19. What is/are unique about ‘Kharai camel’, a breed found in India? They can swim up to three kilometers into the sea in search of mangroves – So, 1 and 2 are correct. In 2015, April they were to given endangered species status hence in News. 20. Recently, our scientists have discovered a new and distinct species of banana plant which attains a height of about 11 metres and has orange-coloured fruit pulp. In which part of India has it been discovered? 2015, October theHindu: Scientists at the Botanical Survey of India (BSI) have discovered a new species of banana from a remote tropical rain forest on the Little Andaman islands. The new species is about 11 metres high, whereas as the usual banana species is about three to four metres high. The fruit pulp is orange in colour, distinctive from the white and yellow colour of regular bananas. 1. It is a tree species found in a part of South India. 2. It is one of the most important trees in the tropical rain forest areas of South India. It was in national media during April 2015, when Andhra Pradesh police killed 20 Red Sander smugglers in an encounter. So first statement is right. Red Sanders is associated with Tropical dry deciduous forest. Says google book and . MoEF Hence 2nd statement wrong. 65. Recently, for the first time in our country, which of the following States has declared a particular butterfly as ‘State Butterfly’? June 2015 theHindu: Maharashtra government has declared the Blue Mormon (Papilio polymnestor) as the State butterfly. 97. In which of the following regions of India are you most likely to come across the `Great Indian Hornbill’ in its natural habitat? It seems UPSC’s prem for Great Indian Bustard and Vultures died by Diclofenac, is vanished and now its new love-interest is Great Indian Hornbill. Frontline says the great Indian hornbill is found in the dense emerald patches of the Western Ghats, the bird is also known as the bird of the heavy rainforest. As such every once in a while, theHindu would publish some travelogue / safari type article in its metro editions, but there are dozens of such birds, animals, reptiles. Difficult to memorize and recall which is found where. (d) 2 and 3 only Last year Godavari, now this year Brahmaputra tributaries asked.3. Which of the following is/are tributary tributaries of Brahmaputra? World geography two MCQs Nothing from world geography, but they did ask good amount of IR. Geography had lot of variety- some ‘pairing’ question, some map based questions, some physical geography “factors-affecting” type question and so on…. Just four MCQs. 1 on Energy and 3 on river/ports linking. excessive use of nitro-fertilizer leads to.. This time “intensive millet production”- another similar low-profile scheme. Again question about Nitro-fertilizer. Why neem coating of urea (one type of nitro-fertilizer)? Although not much geography asked in prelims this time, but since it comes again in Mains-exam General Studies paper-1 so it has to be prepared in a diligent manner- starting with the NCERTs. 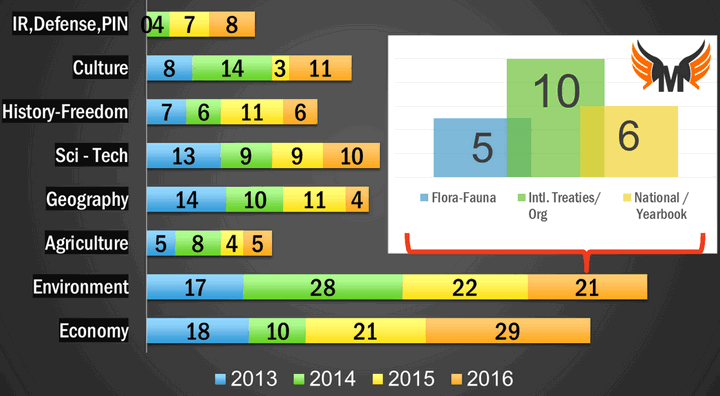 (Though 2016 was worst case scenario- still one MCQ has come from Class-11 NCERT- like last few years). Class-11 NCERT has to be prepared by heart- whether appearing in CSE or CAPF or CDS. Every subject reaches its peak and then falls down. Geography and Polity have touched almost the bottom with hardly 4-6 MCQs from each. So within 1 or 2 prelims again their rise should come. 3. Which of the following is/are tributary tributaries of Brahmaputra? Brahmaputra’s main left bank tributaries, viz., Dibang or Sikang and Lohit…. the important right bank tributaries are the Subansiri, Kameng, Manas and Sankosh. Therefore, all 3 correct. Although rather difficult to recall in examhall, given the factual nature of information. 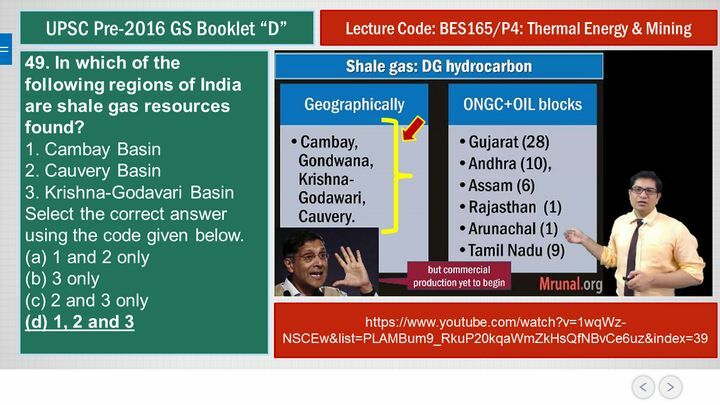 Mrunal’s Lecture BES165/P4: Thermal Energy: – all of them are correct. This is verbatim given in Economic Survey 2013, page 196 [again two mains old report- because 2013 survey means it was published in Feb-2014]. A regular aspirant can’t be expected to have gone through such old information or memorize it. This is sheer luck / Khudaa mehrbaan that somehow I got this last minute idea to add that info. in present year’s video and slide. 60. Recently, linking of which of the following rivers was undertaken? <atarget=”_blank” title=”theHindu” href=”http://www.thehindu.com/news/national/andhra-pradesh/after-river-interlinking-focus-on-water-tanks/article8867726.ece”>July 2016 theHindu: Andhra Pradesh Government has succeeded in interlinking Krishna-Godavari rivers through the Pattiseema lift irrigation scheme and 10,000 cusecs of water from the Godavari was being presently drawn on a daily basis through the project to meet the requirements of the Krishna delta. 71. Recently, which of the following States has explored the possibility of constructing an artificial inland port to be connected to sea by a long navigational channel? 2. The FAO accords the status of ‘Globally Important Agricultural Heritage System (GIAHS)’ to traditional agricultural systems. What is the overall goal of this initiative? There is no provision to give GI to “ALL” variety. Hence by that logic, eliminate all options and we are left with answer B- only 2. 23. With reference to ‘Initiative for Nutritional Security through Intensive Millets Promotion’, which of the following statements is/are correct? 1. This initiative aims to demonstrate the improved production and post-harvest technologies, and to demonstrate value addition techniques, in an integrated manner, with cluster approach. 2. 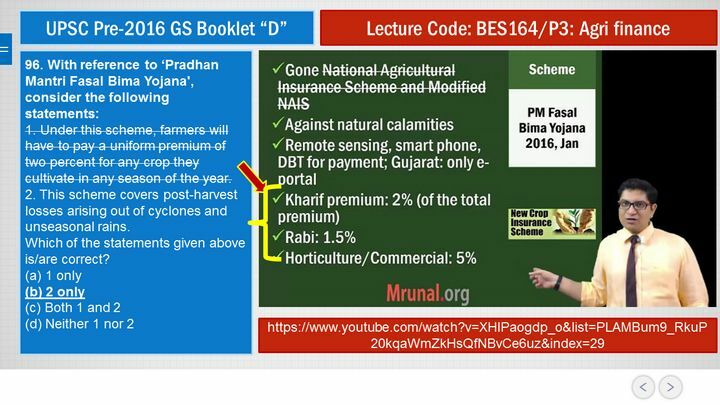 Poor, small, marginal and tribal farmers have larger stake in this scheme. 3. An important objective of the scheme is to encourage farmers of commercial crops to shift to millet cultivation by offering them free kits of critical inputs of nutrients and micro irrigation equipment. 2nd statement is right – by logic that millet cultivation is done by such poor, marginal, tribals only. And not be the tracktor walla rich farmers in Punjab and Haryana. As such policy aims to give free kits but “wanting to shift commercial crop farmers to millet” doesn’t fit logic (after all tractor walla is not the target audience). There is no such mention in the scheme, nor any talk about giving micro-irrigation equipment. Hence 3rd statement wrong. 58. Which of the following is/are the advantage /advantages of practising drip irrigation? Irrigation salinity is the rise in saline groundwater and the buildup of salt in the soil surface in irrigated areas. What can I do to avoid it? They’ve suggsted avoiding over-irrigation of crops by using techniques such as drip irrigation. Hence eliminate #2. we are left with C- only 1 and 3. Plastic mulches used with drip irrigation effectively reduce salt concentration from evaporation. So on that logic, Answer is 2 is right. Hence answer has to be “A”. Final Judge: UPSC’s own official answerkey. 99. Why does the Government of India promote the use of Neem-coated Urea’ in agriculture? 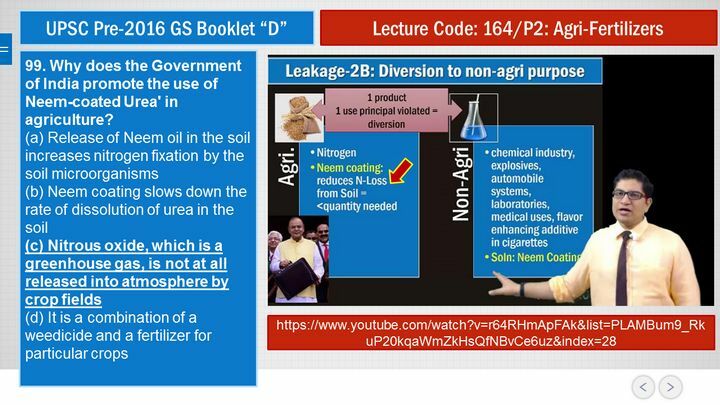 Mrunal Lecture BES164/P2: “Neem coating reduces N-loss from soil, therefore less quantity needed.- hence Government promoting” This eliminates A and D.
1. Under this scheme, farmers will have to pay a uniform premium of two percent for any crop they cultivate in any season of the year. 2. This scheme covers post-harvest losses arising out of cyclones and unseasonal rains. Mrunal’s Lecture BES164/P3: first statement is wrong. Premium varies depending on crop. And by gut-feeling too it has to be wrong because the statement contains absolute term “Any crop”. Post-harvest loss also concluded – IE Jan 2016. So 2nd statement is right. Some people have doubt whether cyclone and unseasonal rains covered in post-harvest. Answer is yes- Ref: page-2 of Haryana government notification for this scheme. Hence, only 2nd statement correct. Thank you mrunal sirji….you have been awesome…got checked my ques….i feel like…whichever ques i have got wrong…all have been in doubt catagery…it is like…my range of marks is grown from 106.73 to 114….😠😠….sleepless nights…n impossible to study…n ultimately….again that silly question…what could be the cutoff….?? hi. could able to clear prelims? 1) Should I be expecting to write Mains at 110 Gen? 2) When will you start the Mains lecture series? I don’t know how this is a controversial question! sir, what are the chances to qualify with 100 marks. Sir I’m expecting around 105-110(gen.) What are the chances… pls pls pls reply… I’m worried very much..
Prabhat kya tumhari email I’d send kr sakta hai. Thoda discussion krna tha. Soil erosion and Soil salinity is lessened by using drip irrigation.So in that case NOT option. Sir I am a obc candidate. N my score is around 103. Is there any chance? Sir I am a obc candidate. My score is around 103. Is there any chance of me qualifying pt ? Thank you sir… if you could predict cut off !!!! getting 112-115, should go for mains or not? Start it right away. Cut-off might go down to 100 as well. Don’t waste your time… immediately start your mains preparation..you will surely qualify for mains… cutoff won’t cross beyond 112 at any cost…. Is there anyone with Maithili Literature in Mains 2016..
Kindly leave your email or ph bro.. 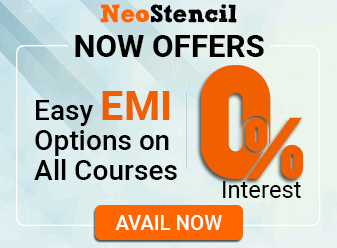 Yes i hv my optional maithili,give me ur e mail id..
from where u have taken class…. r u giving mains this year..i also need some help.